A discussion guide from the movie’s producers. To obtain the movie go to PaulMovie.com. For an additional discussion experience, including film clips, click here. 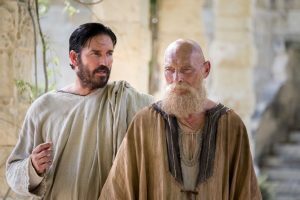 Paul, Apostle of Christ offers a moving personal depiction of some of the lives behind the birth of the early Christian Church. It brings to life the real human struggles, fears, and challenges of some of the individuals of that time. It also powerfully depicts the historical context of the early Church and portrays what life may have been like for those followers of Jesus, who were trying to live out their new faith in the face of the life-threatening persecution and danger of Emperor Nero’s Rome. It deals with themes such as love, grace, guilt, forgiveness, mercy, discernment, and perseverance in the face of persecution. This discussion guide will review two of those themes: 1) mercy and forgiveness, and 2) perseverance when persecuted. Read about the first martyr of the Church, Stephen, and the person who oversaw his execution in Acts 7:54-58; 8:1, 3. 1. Who is this person, Saul, whom you read about in this passage? 2. What do you know about him? (Note to catechists: Saul of Tarsus was a well-educated Pharisee, having sat at the feet of Rabban Gamaliel, who is considered by Jewish historians to be one of the greatest teachers in the annals of Judaism. Saul was passionate about stopping the early Church from spreading and received permission from the high priest to take his persecution to Damascus [see Acts 9:1,2]). 3. How does this Saul from Scripture compare to the Paul you meet in the film? 4. How has he changed? What changed him? 5. How does Paul struggle with his past in the film? Does this struggle seem normal, or predictable, or reasonable to you? Why or why not? 8. How does Luke show God’s mercy to the Roman soldier Mauritius? How is Luke an example of Christ to Mauritius and his family during this time? 9. Have you ever been in a position where you could choose to show mercy? What happened? 10. Have you ever had mercy shown to you? What happened? 11. Can you think of a situation you are experiencing right now that requires mercy? 12. How has God shown you mercy? How have you responded to that mercy? ■ Have your students consider their answers to discussion questions 9–12. Use these answers to pray the Divine Mercy Chaplet together. Each set of answers can be the focus of a decade, with the fifth decade focusing on Jesus’ mercy for the whole world. then pray a prayer of thanksgiving together. 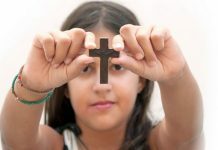 ■ Walk the Stations of the Cross, encouraging your students to think about the ways Jesus has shown mercy to them individually and asking Jesus to help them show his mercy to others. 1. Did the film show you anything new or surprising about the persecution of the early Church? If so, what was it? 2. Emperor Nero was intent on snuffing out the Church. Why do you think he failed? 3. How did Priscilla and Aquila live their lives differently than the rest of the Roman citizens? What (or who) gave them the strength to do this? to act? What did you do? 5. Priscilla and Aquila were willing to risk imprisonment, torture, and death to care for the people of Rome. Where did this courage come from? What do you think they hoped to accomplish? 6. Tarquin, a young convert to the faith, risked his life to deliver a message that could lead the Christian community safely out of Rome. What would you be willing to risk for the sake of the Church? Would you deny your reputation, preferences, or safety? Why or why not? 7. In what ways do you see the Church persecuted today? In what ways have circumstances changed for the Church today? 9. Looking at the Scripture passages above, especially the verses to the Romans, how did you see them lived out in the film? 10. In 2 Timothy, Paul tells Timothy to expect persecution if he is living a life led by Christ. Do you think this is true today? 11. Have you ever suffered for what you believe? How did/does your suffering differ from the suffering of the early Christians? 12. Can you use this passage as a way to measure the visibility of your faith? It is important for youth and adults to become better attuned to what it means to be persecuted for the faith. Some of us may have already experienced uncomfortable arguments, maybe a few insults, or some rejection. But most of us have not been asked to face torture or death for what we believe. Discussing persecution with your students and opening their eyes to what people around the world are willing to suffer for their faith can be perspective-changing for them. ■ Take some time to learn about the kind of persecution the Church is facing today. Research incidents of Christian persecution in Iraq, Syria, Nigeria, and North Korea. Use the information to write intercessory prayers to pray together as a class. ■ Have each of your students choose one of the martyrs you have discussed in question #8. Pray together, asking for the saints’ intercession on behalf of 1. the persecuted Church; 2. the governments of the countries where the persecuted live; 3. courage to live their own faith in a visible way; and 4. unity within the Church. There are plenty of directions you can take a discussion about Paul, Apostle of Christ. If another theme has struck a chord with you, maybe the Holy Spirit is speaking. Discussion questions can flow from what has moved you and what you want your students to know. 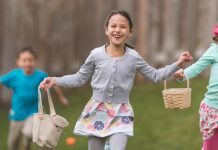 Some other options may include: 1. having your students choose a character with whom they identify and exploring why that’s so and what the Lord may want to do in their lives as a result; 2. exploring the three different reactions the Roman Christians had to their persecution: leave, stay, or fight. Which would your students choose and why? No matter the direction you choose to go, always be open to the possibility that the Lord has other plans. Be open to the Holy Spirit. Becky Groth is on staff at ODB Films, which produced Paul, Apostle of Christ. See more at ODBfilms.com. 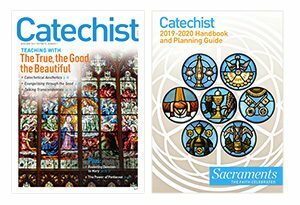 This article was originally published in Catechist magazine, September 2018.